I’d like to take this opportunity to show my appreciation for everyone who was involved in helping us. I know it’s a lot of work involved and not easy trying to find sponsors. May Hashem bless you all for your time and effort and give you what your heart desires. Thank you again for expediting and approving the application in such a short time. Have a beautiful and restful shabath. I want to add that I spoke to Mrs. _______________ today the daughter in law of the _______________ Family who lost their mother, she said she has no words.They received the check. Such a yeshua before Purim and Pessach, it is like Manna heaven sent. 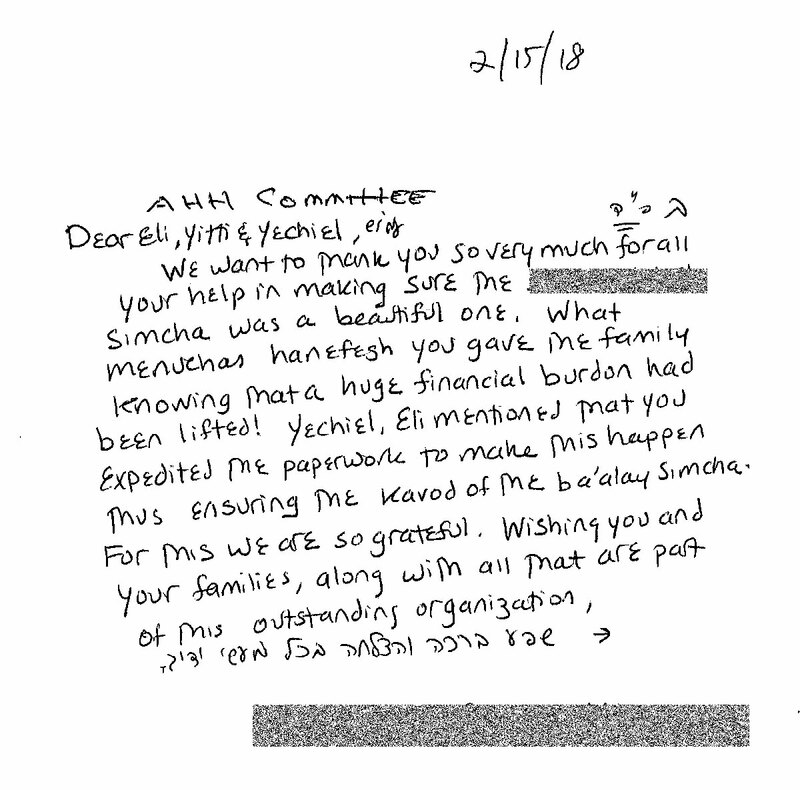 This is an enormous help for the mishpacha and they don’t know if there are sufficient words to bentch the donors. May Hashem give you all the strength you need to continue this monumental endeavor, and may the simcha you create in the hearts of those touched by sorrow, be a zchus for you all to be gebenched midah kneged mids, that simcha should overflow in your daily lives with yeshuas, refuas and kol tuv! I just got home and received your check. The first thing I wanted to do was say “Thank You”. Without your wonderful organization I don’t know how I would have done it.With such dignity and making me feel comfortable. There aren’t enough ways to say thank you. You should be able to help many people for many years to come. Please forgive us for being so late in expressing our sincere thanks & appreciation to your wonderful, selfless organization, which we came to know 8 years ago when our dear brother, ________ ________ a”h, passed away at the young age of 32, after fighting a 2 year battle with a brain tumor, L”A, leaving his dear, devoted wife a widow, with 6 Young orphans. Words are insufficient to describe the trauma that the family endured. It was then, that your organization stepped in, with so much Chesed, to alleviate some of their difficulties. Immediately after his passing, your funds came in so timely, as to save ‘the boat from sinking’. Your financial support gave the family the stability to continue living in spite of this dire situation. 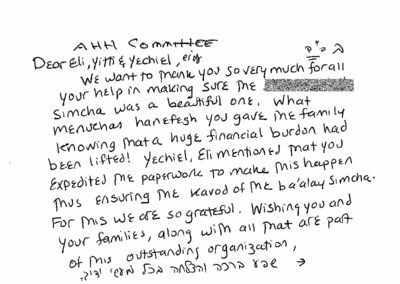 We were amazed when speaking to your volunteers, which include busy doctors, lawyers, rebbes etc, who gave of their precious time, even with such busy schedules, to help this family, as they do other needy Yidden. Bichasdei HASHEM their oldest child got married in September 2016. The excitement was strong, as was the financial worry. Yet Avigdors Helping Hand came by with a $____ Grant, and a smile, which definitely helped to alleviate part of the Almunah’s financial burden. Just recently, in January 2018 their second child, a son, got married in Montreal. Once again, you went out of your way to accept her application, and with a smile, helped her with a $____ Grant for which we cannot thank you enough. I conclude with a request to HKB”H, and ask that HE bestow upon you, your volunteers, and your entire committee all Brochos for gazint, parnusa, nachas, and May you be Zoche to close this organization soon, with the coming of Moshiach speedily in our days. ________ ________ , In the name of ________ Family. With deep feelings of gratitude, I would like to express my appreciation for all that you have done for the yesoima __________. It is only due to your inestimable assistance that the impossible has become a reality. With grace, dignity, and—most importantly—in timely fashion, you pulled the strings to enable an orphan to celebrate her wedding with joy. Your benevolent deeds will always be remembered; they were evoked with heartfelt thankfulness this past week, as the step grandmother of the kallah gave in her tefilla with tears in her eyes at the tzion of her holy father, the __________ Rov z”l. Our hakoras hatov to you is big big. May you merit, in every area of life, blessing and bounty; prosperity and plenitude; the ability to give, to gift, and to grant. May Hashem reward you with health, happiness, and much nachas in addition to the immeasurable zchus of helping a yesoima.